I recently bought a house that has been treated in the past for termites. I have not seen any signs of living termites, nor did the pest inspector, but he suggested a refresher treatment. I started replacing some of the damaged wood trim around the house and discovered carpenter ants, with a live nest. I was thinking of using Termidor to kill the ants and prevent termites. What would be the best way to apply Termidor to remedy both situations? You are talking about 2 different treatments. For subterranean termites, a shallow trench is dug around the perimeter of the home and a liquid solution of Termidor is applied at a rate of 4 gallons per 10 linear feet. Usually about 80 finished gallons around a 200 linear feet home. For carpenter ants, the treatment using Termidor is much different, as you cannot spray more than 1 foot up the foundation or 1 foot out from the foundation. The Termidor is mixed in a hand spray tank and this area is sprayed until wet. Termidor is not legal to spray indoors. 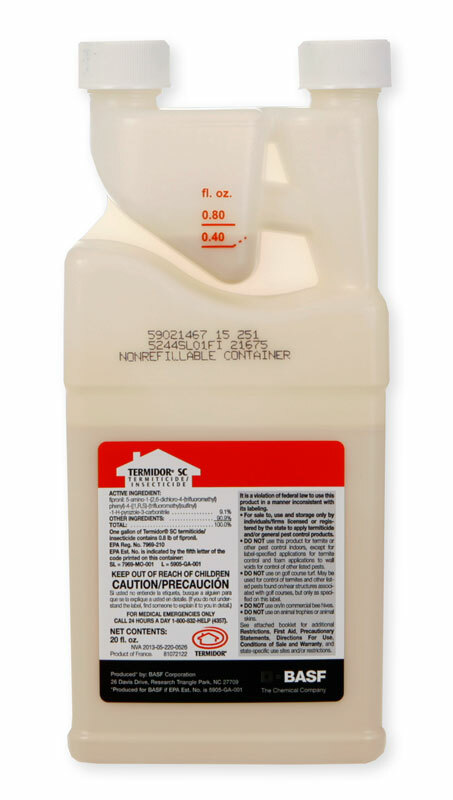 For any indoor treatment, Termidor can only be applied into walls and voids. Termidor Foam is the best product to use indoors. Don't spray baseboards with it. Carpenter ants are always best controlled using baits. The KM Ant Pro system has long been the easiest and overall best solution to controlling carpenter ants.